I've always loved walking. 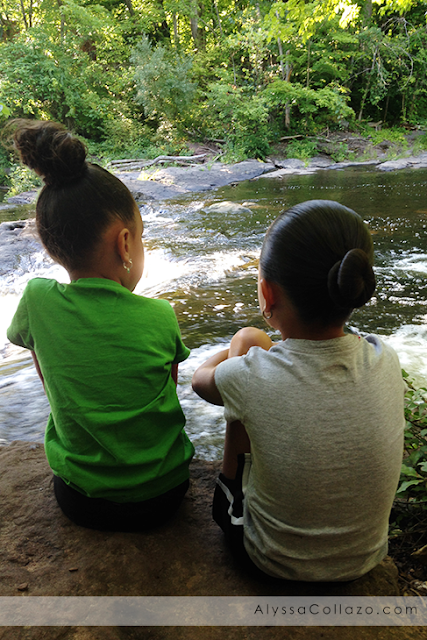 I walk to keep myself active but I never really hiked until one day we decided to take our daughters to a local trail. And since, Hiking has become a family favorite activity. Hiking is great for kids and here's why. Growing up, my siblings and I spent the entire day outside. From making mud pies to playing tag. My mother definitely knew what she was doing. It's healthy for kids and I'm sure she needed a break. Times have changed. In a study published in 2010 by the Kaiser Family Foundation, the average American child 8-18 spends 7.5 hours a day on electronics of some kind. That's computers, smartphone, videogames, tablets, or other device. That doesn't allow for much outside time. In fact, the average US kid spends only 30 minutes per day in outdoor, unstructured play. This spike in electronic use has coincided with a rise in childhood obesity, decreases in children's attention spans, and decreases in interpersonal skills. Hiking is more than walking in the woods. It's not a timed event. Hiking allows you to immerse yourself in a new environment, to spend time there. You have the choice to take your time, explore and wonder. Let kids know that it is ok to sit and listen for sounds or to stop and look at an interesting plant or frog on the trail. Don't rush. This will build their observation skills and make them curious about what they are taking in. There is a whole new world to explore out there. Hiking is a great exercise for the entire family. I like it because sometimes it doesn't even seem like exercise. Even those who are really out of shape can find a flat, easy walking trail to start out on and can build from there. And, hiking is free!! No membership required! Hiking gives appreciation of nature, it's beauty, and how it all fits together. You can read books about nature. You can do an online nature simulation. Nothing compares to being in nature and experiencing it first hand. That experience can change the way kids look at the entire world and their place in it. Check out your local park to find trails near you. Sites like AllTrails.com and LocalHikes.com are helpful, as well. My kids love to go hiking. They have so much fun exploring and looking for bugs & animals along the way. What a lovely hike! Where we live there is a lot of hikes, but it is all brown and rocky and I rather have trees and streams. So when we can we go up north and hike there! I love the reasons you give for hiking! We always try and find a place to take the kids to explore when we travel. Not only is hiking a good way to learn about the area you are visiting, normally it is very inexpensive or even free! The pictures and moments you capture on a trail are worth the achy knees and sore back the next day! Hiking is fun and it really is a great idea to take your kids. It's an exciting way to show them how beautiful nature is. These are all great reasons! I need to take my daughter hiking way more often than I do. Hiking is a great exercise for all kids. Mom use to take us siblings for walks, hikes or anything similar to wear us out. It worked as we explore river beds, trails, forests and more. Hiking is so much fun for adults and kids. We've got great memories of hiking to waterfalls and being excited about seeing the waterfall for the first time. We go hiking all the time. Down here in the south, there's nothing but nature to explore. Never been hiking with my daughter but I know it's something she will enjoy since she loves nature. She's coming out like her dad, she loves taking pictures too. 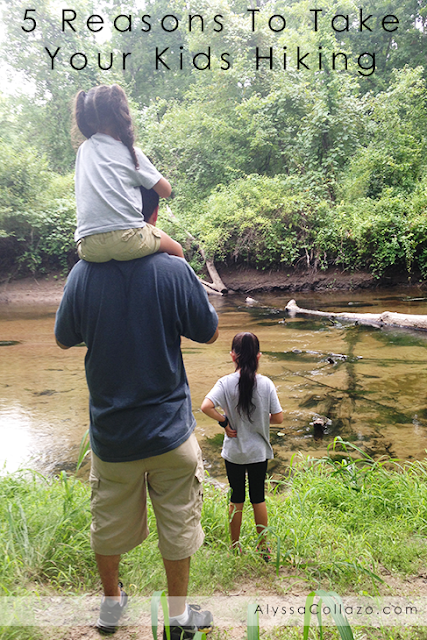 Hiking is a great way to get your children active,spend time together and enjoy nature! My kids are not big into athletics BUT they do enjoy the hike when I drag them out there! Its always surprising to me how easily kids stay enteratined while hiking or just exploring the outdoors. They naturally are drawn to all the little details of nature that us adults tend to dismiss or ignore. I went on tons of hikes with my kids when they were little. There was so much to see and it really kept them engaged. I love taking our little ones on hikes. They really enjoy seeing new things and exploring. The last one is very true and the most important thing. Let them see and experience the true beauty of nature. We enjoy hiking too, bit we usually get distracted by tree climbing or playing in ponds, ha ha! I don't mind, because it's so great for the kids! Never been hiking before. It's something that I've always wanted to do with my kids. Maybe someday I'll get that chance. These are truly great reasons. We go hiking whenever we can because it's a great family experience and definitely gets everyone some exercise. Hiking is so much fun and such a great way to work out too! Staying active is such a great thing for kids! Hiking is such a great thing to do is a family. There so many things for the kids to see and explore. Hiking is such a healthy and fun activity for the whole family. We used to do this but when my kids got allergic to mosquito buts we kind slowed down. There are a lot of hiking trails here in our area, but we've never been to one yet. We did hike near the lake and it was fun. Hiking is definitely a great exercise. I used to love to go hiking. We live near the Blue Ridge Parkway, where there are plenty of hiking trails. It is a lot of fun to get out in nature and enjoy the scenery. I love hiking!! I think it's good or kids because then they can really experience the great outdoors!! I love hiking and wish we did it more. We make it fun by adding geocaching to the mix. Its a lot of fun hunting for treasures. I take the camera sometimes to really get with nature and practice my skills. Other times I'll just sit and listen to nothing, or draw. Hiking together really does build up great memories. I have these kinds of memories with my family too. We love to go hiking. We live in the city so it is nice to be in the nature. It is so good for the kids to. I wish that we had some hiking trails in our area. We probably have a few but during the summer time it's just too hot outside unless your in the pool. I try to send my kids in the backyard to play when it's cooler. I wish things were like they used to be. We could go outside and play with the fear of being kidnapped. I don't care for my kids to play outside unsupervised. It's not that I don't trust them. I just don't trust some of the people in the world. We have so many great places for hiking around us. I really can't wait until my youngest is old enough to participate. Love this, I've been hiking a few times and my son keeps asking to go. I'm going to plan us a fall family trip to go hiking. I look forward to capturing those moments just as you've done. Our whole family really need to get outside more often. Hiking looks like an a great way to get out and explore! Your photos are great too! The kiddos looked like they had fun! This is a cute idea to take your kids hiking! Quality time and exercise is definitely great for children! I always think it is fun to get the family outdoors and connected with nature! There are so many fun things to explore along the way! I love hiking and I believe that kids naturally love hiking. So that alone is one big reason why you should walk them to places interesting to them. I love to hike and I agree 100% with everything you said. 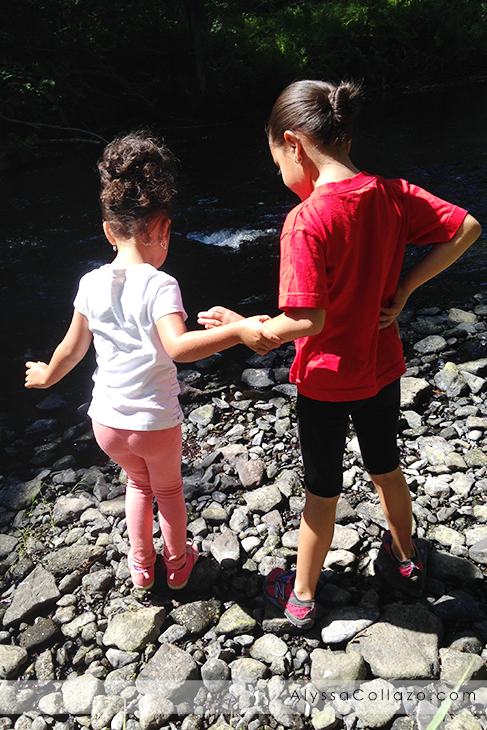 Hiking is so great for kids to get out and explore and the best part is that its FREE LOL. Great post!! Hiking is the best! I just need to get hubby to enjoy it more because my daughter and I just love it.